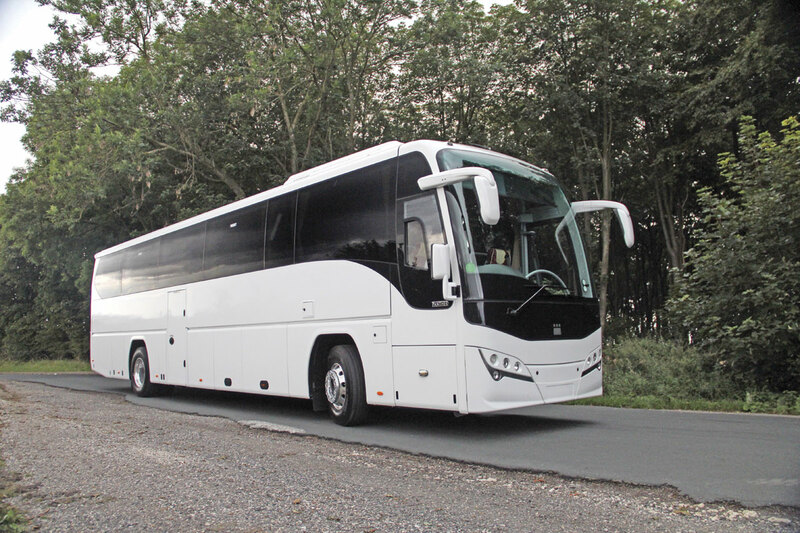 Early this year we took a first look at Volvo’s right hand drive Euro6 coach products when we carried out an evaluation of the three-axle B11R with the company’s own 9700 coachwork (B&CB issue 1261, 31 January 2014). 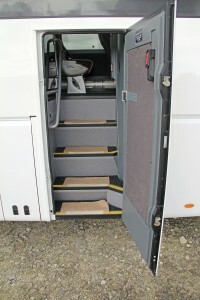 Traditionally, volume sales of the marque’s chassis have been in combination with the range of models from the Plaxton stable, which these days are exclusively mounted on them. The plan had been to introduce the new look along with the change from Euro5 to Euro6, but with it clear that the B9R was going to remain available for longer than anticipated, Plaxton decided to offer the upgrade of the popular Panther coach body on the Euro5 range, unveiling the Panther 3 late last year. Hitherto no Panther 3s on Euro6 examples of the new B11R chassis have been available for evaluation as the bulk of production has continued to be Euro5 based. 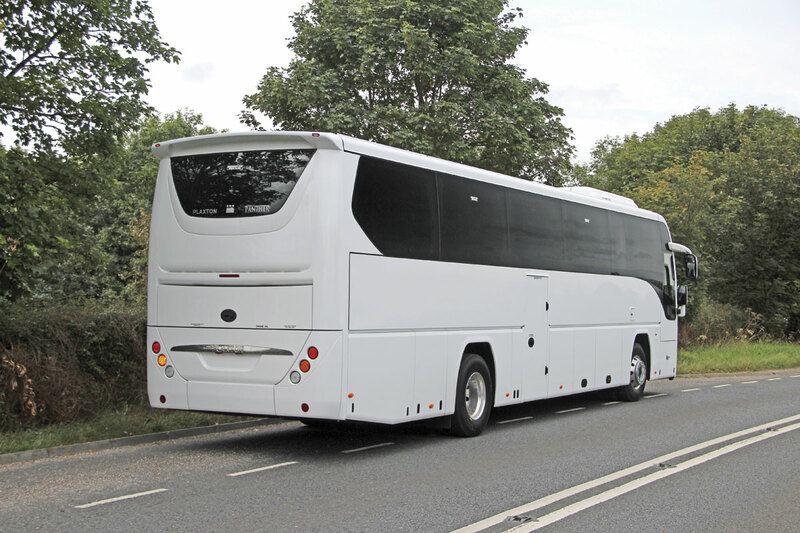 This month we were given the opportunity to travel up to Scarborough and try one of the first 12.8m B11R Euro6 Plaxton Panther 3s which was complete but had not been fully pre-delivery inspected by Plaxton. Simon Dew and I caught the train from Peterborough to Seamer station, just down the road from the factory, where we were met by Andrew Warrender, Marketing Manager for Plaxton Coach & Bus and joined by Norman Thomas, Product Engineering Manager for Volvo. As Norman had explained to me earlier in the year, Volvo’s coach engine range has been reduced from four to two for Euro6. The seven, nine and 13-litre Euro5 options have gone, the eight litre D8K has been introduced and the Euro5 11-litre has been upgraded to the D11K to meet the Euro6 emission limits that it was designed from the outset to satisfy. Only offered for a relatively short time in Euro5 form, the B11R is a six-cylinder in-line engine with an overhead cam, four valves per cylinder and, unlike the Euro5 variant, high pressure common rail injection rather than unit injectors. The D11K has been developed to offer three outputs: 380hp (280kW), 430hp (316kW) and 460hp (339kW). Our evaluation coach had the D11K-430 unit which gives peak torque of 2,050Nm at 1,000-1,400rpm. This is only 150Nm less than the 460hp engine. The standard gearbox option is Volvo’s AT2412E I-shift 12-speed automated manual system with integral retarder though there is the option of the ZF 6AP2000B Ecolife fully automatic six speed transmission as an alternative, but only when matched to the 380hp engine. Volvo suggests fitting the 430hp unit in two axle coaches, as on ours, and the 460hp engine in tri-axle coaches. Norman had covered all the changes when we met earlier in the year but a walk round the chassis park at Scarborough enabled him to illustrate the changes more easily as the last two-axle Euro5s have still to be bodied and a number of tri-axle Euro6 coaches are also about to go on to the line. 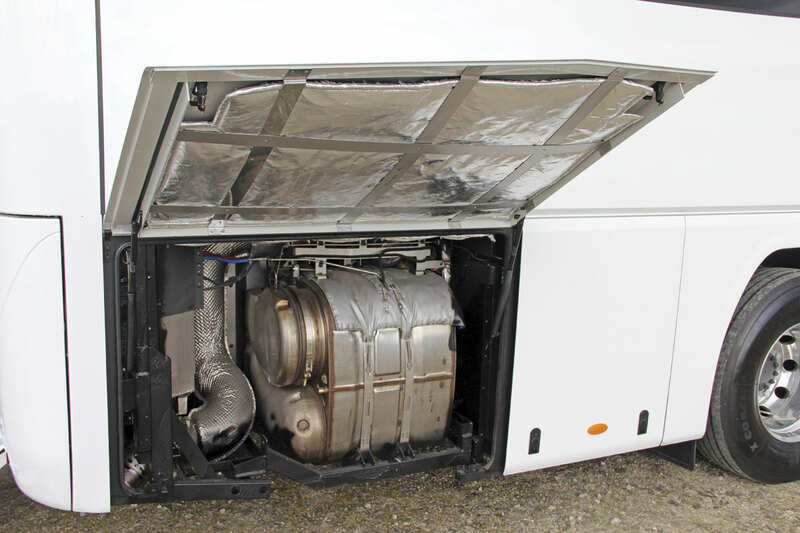 Running at higher temperatures than at Euro5, the Euro6 11-litre engine uses an un-cooled hot-EGR system to control emissions in addition to the SCR system with which Volvo users are already familiar. The EGR is only needed at low temperatures. 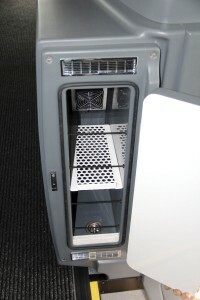 In a locker at the rear offside is a single box muffler incorporating a diesel oxidisation catalyst and a diesel particulate filter that will need cleaning from time to time. Apart from the engine and its associated systems, the other significant change on the B11R concerns the axles and suspension. The Euro5 B11R had IFS (independent front suspension) but the Euro6 has a beam unit described on Volvo’s ordering system as RFS (rigid front suspension). At the rear, it previously had wide set air bags that were mounted on outriggers, but is now equipped with the other system developed for the B11R, with the air bags mounted beneath the chassis rails. Both variants have two bags at the front and four at the rear. 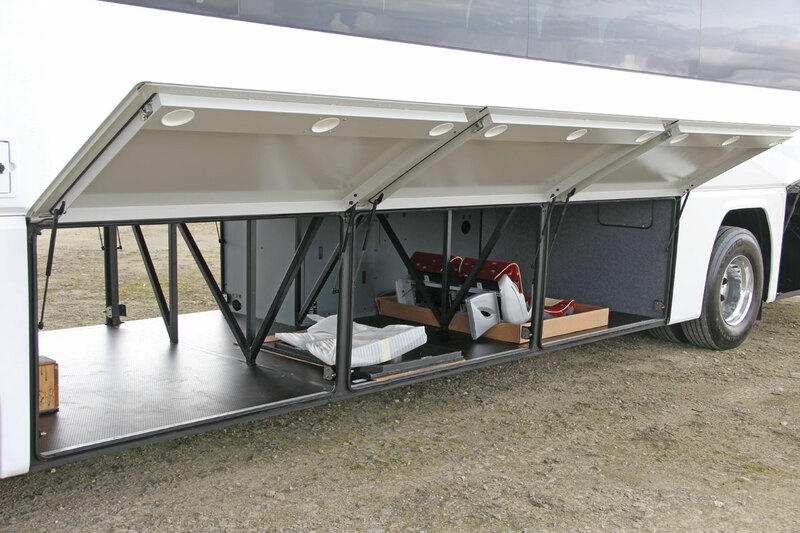 Fitting the narrower set rear system was decided upon because it was anticipated that weight on the rear axle might be an issue with the additional engine related equipment. Having made the decision it dictated that the front axle would have to be the beam. However, Plaxtons engineers were much more successful than they expected they would be and the unladen weight figure came out at only 12,662kg. 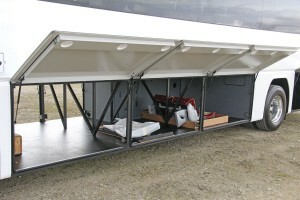 This could enable reversion to the IFS front and outrigger mounted rear suspension system at a later date if necessary. Three axle B11Rs retain the previous IFS. A slight performance difference between the beam and IFS set ups is that the latter has a marginally better maximum wheel angle of 53 rather than 52 degrees. A further change is that on the Euro4 and Euro5 B7R and B9R Volvo always fitted a steering damper. Engineers have now concluded that it is not needed and have dropped it from the specification. 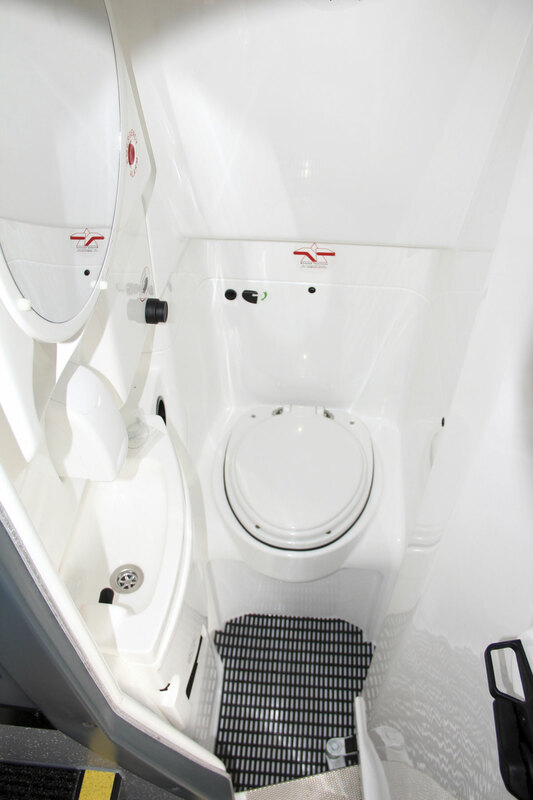 An optional lift and kneel facility is fitted with a 5kph speed interlock. Disc braking all round is accompanied by ESP, EBS 5, ABS, ASR, Brake Assistant and brake blending as standard. An automatic hill start facility is standard. 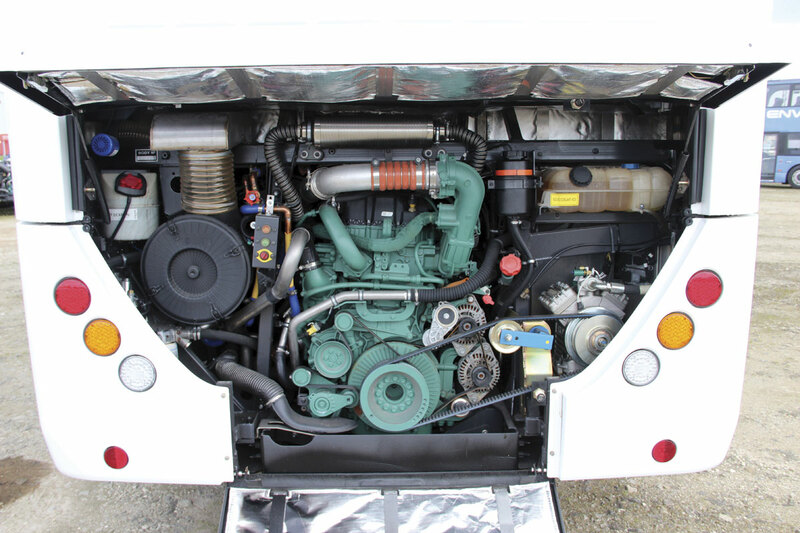 As on the buses, B11R now has the I-Start dual battery system with two separate twin 12-volt batteries. The small starting batteries are totally dedicated to ensuring the bus always has enough power to set off, while the bigger 105Ah main units have been optimised to last longer. Low voltage levels will trip the main switch automatically. The radiator, at the nearside rear, is pivotable for easier maintenance. No coolant filter is fitted. Plaxton’s Panther range was first introduced in 1999 on the B10M chassis along with the Paragon model which had a more upright front and a pivot door rather than the Panther’s plug door arrangement, the rake of the screen precluding a pivot unit. Originally limited to 12m, a number of longer Panther versions were subsequently introduced, among them a 12.3m with an extended front overhang, 12.8m B12M and B12B, and the 15m. The Panther 2 followed in 2010 and has been offered in 12.3m, 12.8m and 15m variants. In total, around 2,000 Panthers and between 350-400 Panther 2s have been built. It was at the Birmingham Show last year that the Panther 3 made its debut on a B9R chassis in the colours of Alpine of Llandudno. 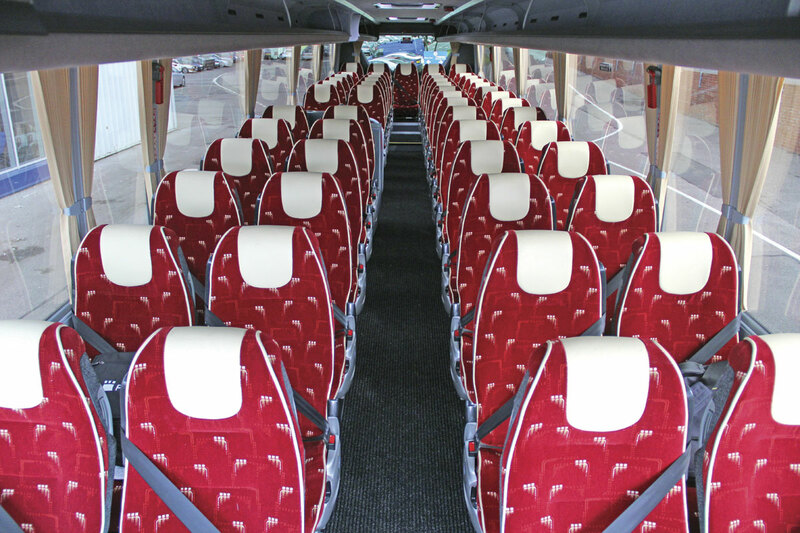 This was a 12.8m example seating 53 with a rear saloon toilet but it can also be supplied as a 12.6m long coach with a lift incorporated in the front entrance and there will also be a 10.8m option. 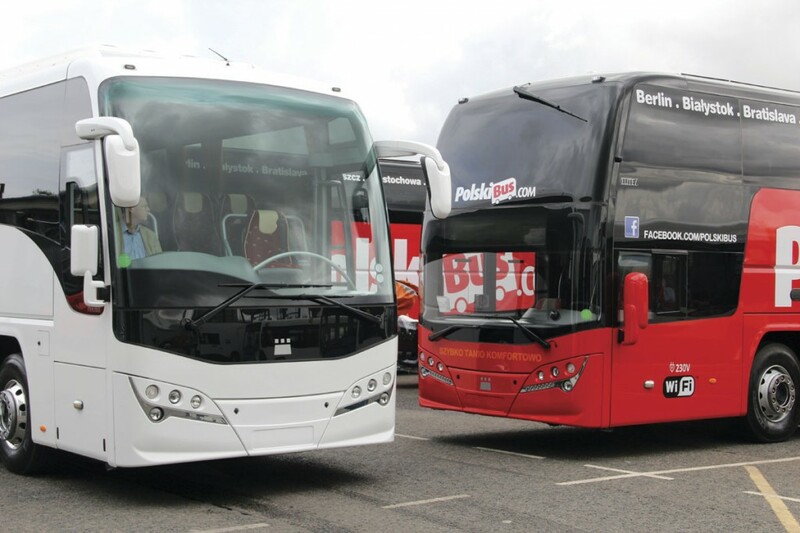 Andy Warrender said Plaxton had not produced a 15m example yet but it was anticipated that it would do so. Framing is assembled in jigs using welded 12% chromium steel, composite single piece GRP main side panels are bonded to the structure, the locker doors are aluminium framed with aluminium panels, and the front and rear are GRP. Covering the roof is a one-piece bonded aluminium sheet. Curved, grey tinted, double glazing is bonded in place with the rear window also double glazed. The direct glazed single piece front unit is 7.8mm thick and laminated. Depending on the configuration chosen, there are various seating capacities available. 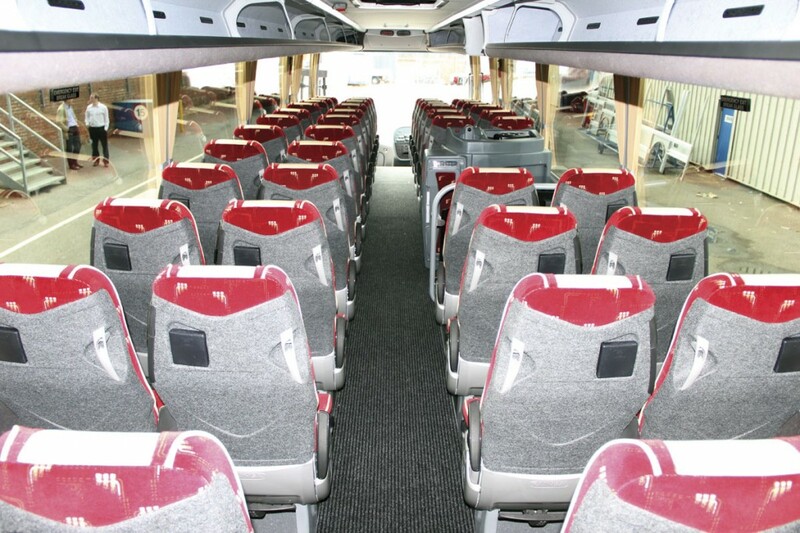 As tested, the coach had perhaps the most popular of these, 53 recliners and a centre sunken toilet. 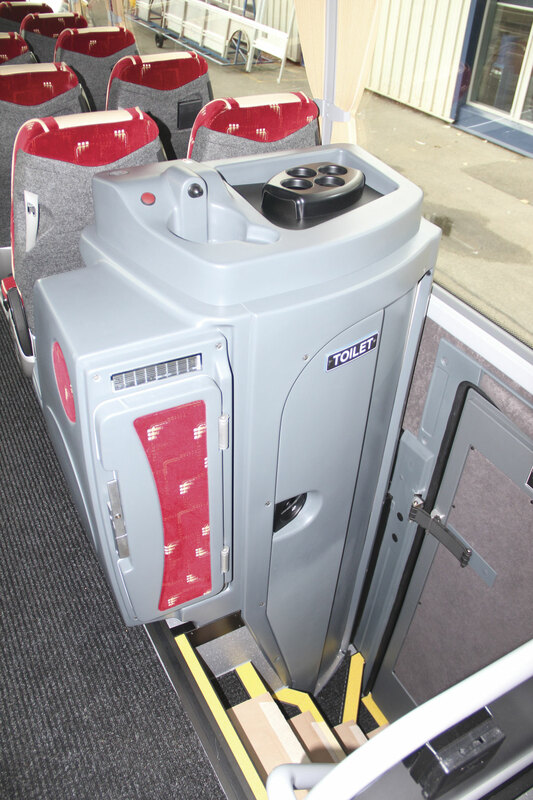 A spare seat and a floor section panel are supplied to enable an increase to 55 seats without the toilet. 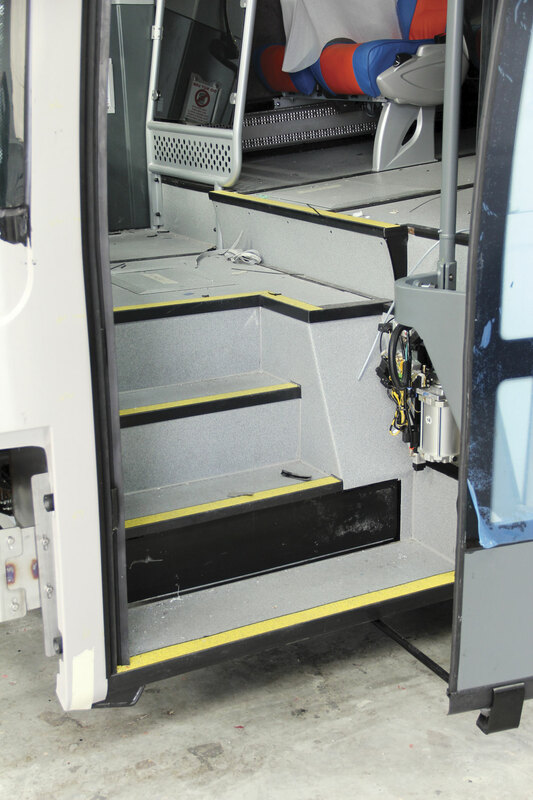 The alternatives are: 57 recliners, no toilet and slide out steps at a rear emergency (parachute) door; 55 recliners, no toilet and a centre door; and 53 recliners and a rear toilet. You could also reduce the seating to increase legroom, with the overhead units moveable to accommodate this. The key differences between the Panther 2 and Panther 3 are focused on the front and rear of the coach, both internally and externally. Firstly, the dash is completely different, derived from that in the Elite but with different finishes. Screwed within the moulded dash, are three main panels in one of two different wood effects, black ash (the matt look on our coach) or black maple (a gloss finish). A large handrail arcs from the lower left of the entrance to the top of the left hand edge of the dash binnacle. Externally, the front panel and styling have been altered and at the rear the change is more pronounced with a new glazing line. The side glazing has also changed though the bays lengths are the same, with the exception of the final bay, which now has a boomerang shaped solid curved edge. This only impacts marginally on a passenger’s view out. 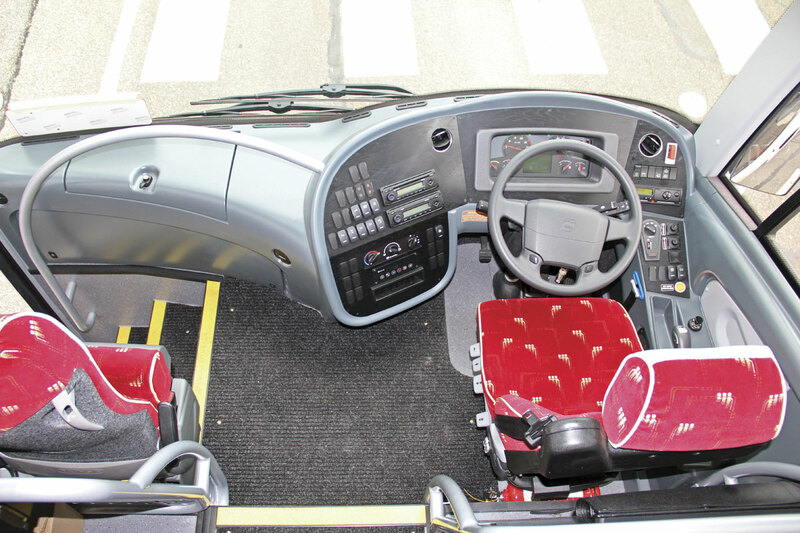 Other changes in the cab see the tachograph mounted within the main control panel and controls are grouped by function with most used nearest the driver. Bosch supply the Classic combined radio/CD player and PA along with driver microphone and the heated driver’s signalling window is powered. Inside, the Panther 3 featured 53 Fainsa Gala 970 recliners with three point universal seatbelts, centre and aisle armrests, cupholders and adjustable footrests. Leather trim is applied to the headrests and, in the form of piping to the seat edges. Two other options available are the Fainsa Stel and the Politecnica GTV. In the traditional position on the offside was a centre mounted Shades Technics toilet unit with a moulded interior. Mounted on top of the compartment was a hot water dispenser and small sink and on the aisle side was a small fridge unit. Underneath, the large central luggage hold has a capacity of 12.4 cubic metres. In addition to the main area there are a couple of smaller lockers. The internal case emblem showed a permitted baggage figure of 781kg. Options available include a pre-heater with a digital timer, alternative seats and seat finishes, two point belts, integrated blown air heating and ventilation rather than radiators and a secondary exit door. 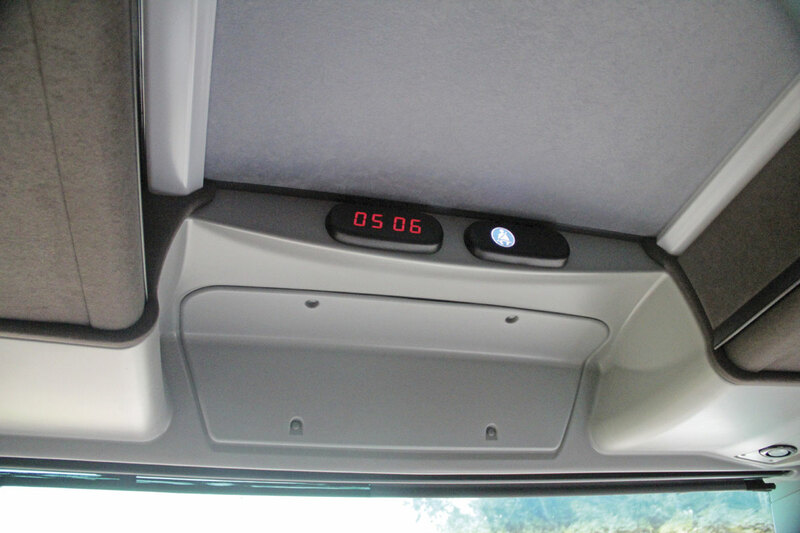 Various audio, video and navigation systems can also be offered. A criticism I have of the Panther that continues on the Panther 3 is the rear engine access. 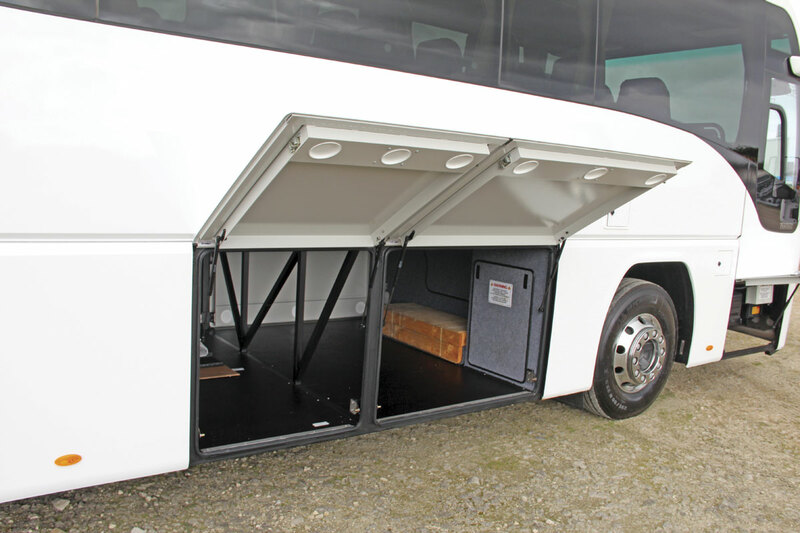 Whilst it is helpful that the driver only need open the upper section to undertake daily checks and topping up, removing the lower panel for anything more serious is a two man job more difficult than simply lifting a top hinged cover. Furthermore, once the catches have been released, there is a temptation to lay the heavy unit on the floor, with the potential for it to be damaged. I have seen a number of Panther rear panels were the attractive chrome effect brightwork has been ruined because it has been scraped along the ground once removed. Where do you safely put it if you break down and are at the side of the road on a windy night? It was fortunate that we had decided to take the detail pictures before setting off on our road run, because just as we were about to do so the heavens opened. The wipers aren’t normally the first thing we look at but the double speed facility was immediately activated and proved proficient at keeping the screen clear, so successful in fact that I was able to grab a picture through it of one of the massive, and massively impressive, 15m B11R Elite-i coaches for PolskiBus.com out on road test prior to delivery. Later in the day, during even more torrential rain, the screen was misting up outside of the swept area, but it turned out that it was on a relatively low setting, clearing once it was turned to high. You are not long out of Scarborough’s Eastfield headquarters before you reach Staxton Hill on the edge of the Yorkshire Wolds, a 1.24km long incline that would test any vehicle as it is a 17% gradient at its steepest. A sign at the top once instructed East Yorkshire drivers to ‘stop and engage low gear’ before descending it. You do get a bit of a run at it from the T junction after leaving the A64 and joining the B1249 and Simon was in tenth doing 36mph when we started the ascent proper. The coach continued to accelerate until it reached 45mph and held that until the steepest part was reached, when it started to slow down, block changing down to eighth at about 25mph on the steepest part before pulling gradually away and into ninth at 30mph and back to 10th at 38mph as the gradient eased. Cruising at 100kph (62.5mph) in top gear (12th) it was showing around 1,350rpm and at 60mph it was showing around 100rpm less. At 40mph it was in 10th at around 1,400rpm. Simon thought it drove nicely. He did feel there was a slight judder through the steering on rougher roads, but not during braking. He found it smoother, more comfortable and less harsh to leave the retarder on the footbrake. Elaborating, he said that using the retarder manually the first and second stages were smooth, but the third was quite harsh and a driver would be concerned about discomforting his passengers. The response was more infinitely variable through the footbrake. Readers will know that I do not like to set too much store by fuel figures achieved over a limited distance on a single day in a very lightly loaded vehicle that may have spent longer than usual idling while photographs are taken. Nevertheless, Norman did set the fuel economy device within the dash, but unfortunately didn’t reset the mileage to zero with the result that on our return no readings for our trip could be extracted, only the total for the vehicle to date, 4,500kms at 10.5mpg. Given the nature of the testing, this shouldn’t be relied upon as representative. From the passenger standpoint, my experience of other B11Rs is limited so I could not say whether the revised suspension layout had had a great impact on the ride characteristics, indeed I thought it rode very well. What was noticeable was how much quieter and less obtrusive the engine noise was in comparison with the old B9R, which I considered comparatively harsh. 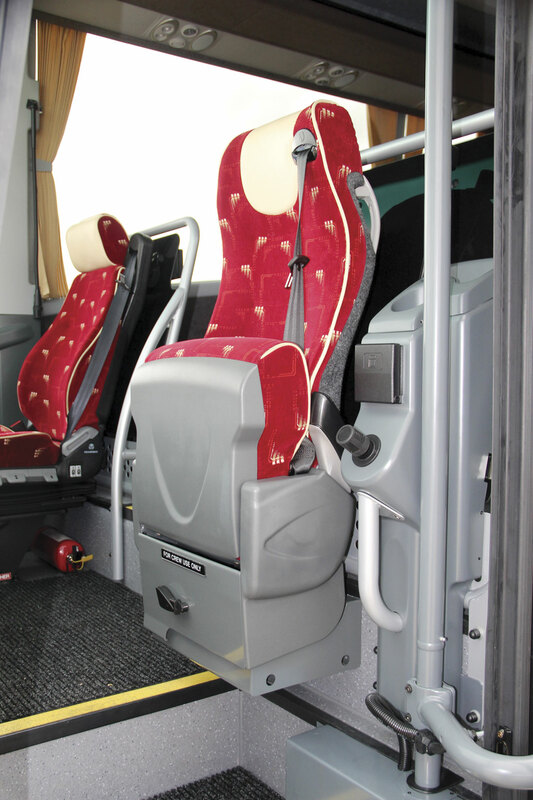 I thought the choice of materials Plaxton had selected was excellent, giving a comfortable yet elegant feel. Though I found the seats did slightly squeeze your posterior, they were still comfortable. One annoying aspect that will no doubt be rectified during PDI was a rattle from the nearside rack about half way down the coach. This appeared to be emanating from a stray screw within the rack itself. Unscrewing one of the passenger service units in the vicinity temporarily should enable the offending fixing to be removed. There was also a brief and intermittent vibration at the nearside rear, usually when the coach was decelerating, which may possibly have been a heatshield. We checked and all of the lockers were locked. The air conditioning seemed quite noisy when it was working hard to get the temperature down initially, possibly because it was mounted so near to the front. I didn’t measure the decibels but it was very quiet when it reached the desired temperature and cut out. The retail price of the vehicle to the specification we evaluated will be £256,280 which is approximately £5,500 more than a similar specification Euro5 example, taking account of the additional equipment that Volvo has had to fit to satisfy Euro6. Orders are now being taken. There will also be a limited stock build programme. The Panther 3 will also be available to order on the Volvo B8R chassis which is the same as the B11R except for the use of the smaller D8K engine and a smaller exhaust system. It can only be supplied with the beam front suspension and narrow set rear suspension. Availability of the B8R Panther 3 is expected to be from early 2015 and the range of specifications offered will be more limited than on the B11R, though there are expected to be 12.6m, 12.8m and 10.8m options. No price for the combination has been announced yet, though some have already been built for the large public sector contract agreed with Babcock. 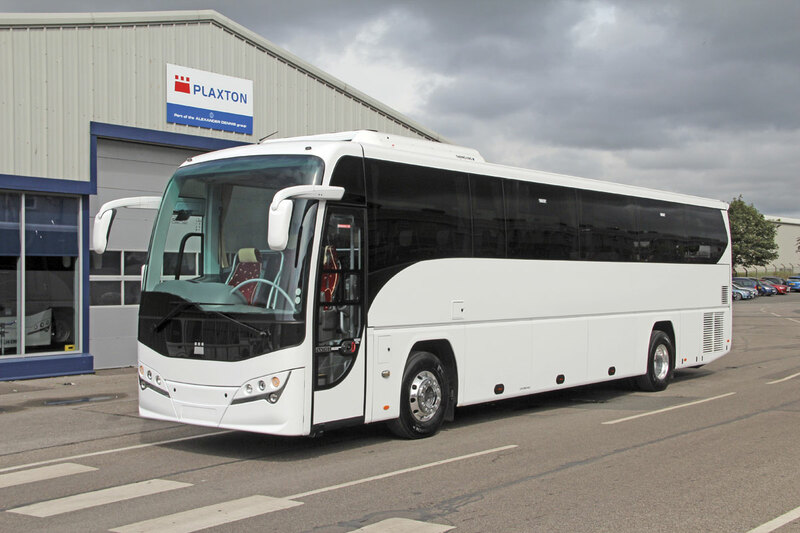 Plaxton’s entry level Leopard will not be offered in conjunction with the B11R. 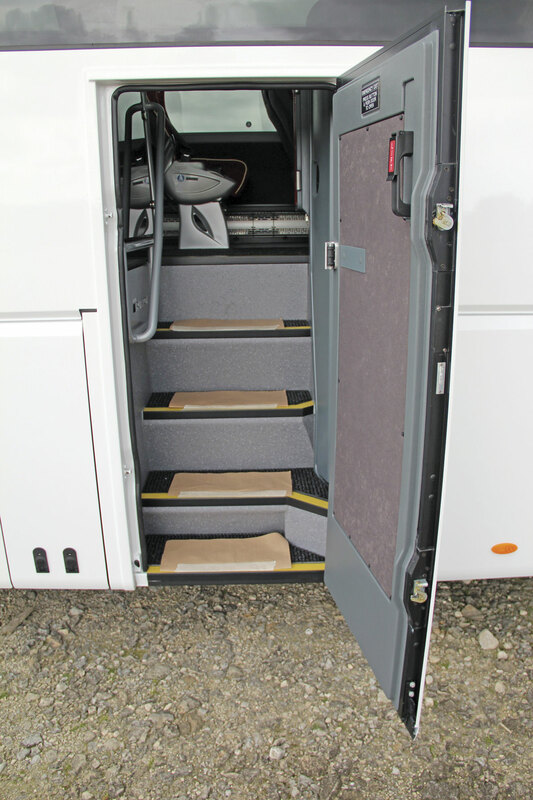 Plaxton’s ability to minimise weight but still maintain a solid durable structure is impressive. Theoretically, without the duplication you inevitably get from a body on chassis concept compared with an integral, an integral should be lighter, but Plaxton have succeeded in being considerably lighter than most if not all of their integral competitors and other comparably specified body on chassis combinations. This has huge benefits for operators in terms of fuel economy as well as the added peace of mind that you are less likely to get pulled up for being overladen. I said when we tested the B11R 9700 tri-axle that with Euro6 Volvo had moved back towards the position it was in when it essentially had one model, the B10M, variations of which were capable of doing almost any task. 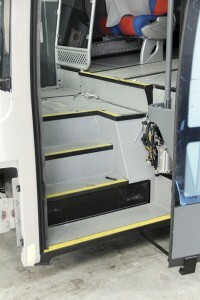 With the common frame of the B8R and B11R and a reduced but still comprehensive engine range, things are now far less complicated than they had become bringing with them the potential for easier parts stocking and a greater chance of support networks being able to train maintenance staff on the bus and coach range.